The PF number is replaced with UAN for challan generation. Member Joins EPF for the First Time – The employer can get the UAN from the EPFO portal by furnishing the information given by the employee in his declaration form. Employer an submit ECR of the employee once the UAN has been obtained from the portal. 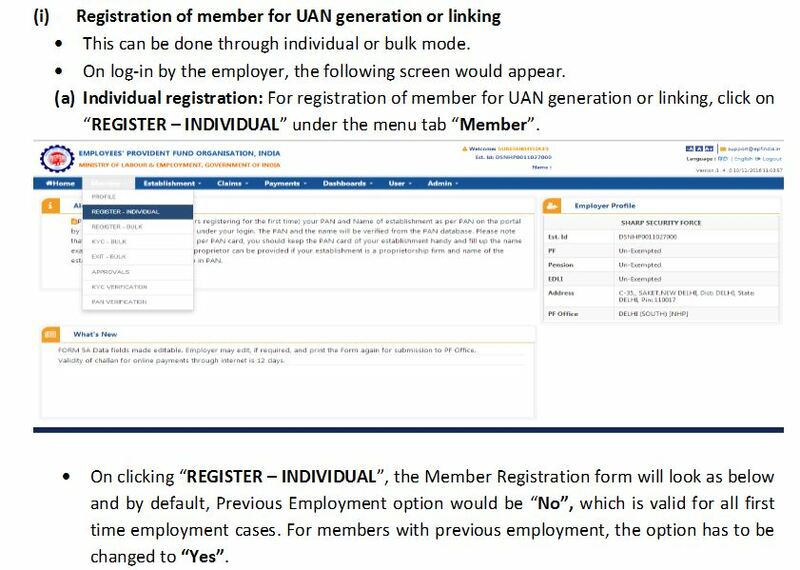 Individual Registration – If an individual registers, an alert message will be shown to employer and his consent will be needed to link the UAN even if there are some discrepancies between the information furnished for the UAN and that given by the employer. If the employer wants to carry the process ahead then the information furnished will be carried forward and can be changed later through separate functionalities. Bulk Registration – In case of Bulk registration and “Allowed with Alert”, alert message will be given in the PDF and the advice that if employer approves the pdf files, these entries will be not considered and in case the employer wants to link the UAN in which there are some discrepancies, it is not possible for Bulk registration. Fresh New Employment – If the employer has declared that the employee is the first time employee, then he will need to make sure that the Aadhar/PAN has been seeded with some UAN. If the same Aadhaar/PAN is already seeded with some UAN, the employer will be prompted that this KYC is already seeded with some UAN and employer has either to provide UAN or register without KYC. However, after registration, the employer can seed same KYC with new UAN.